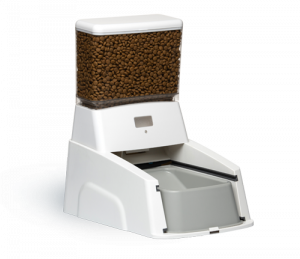 Smart feeders are pet food dispensers that use technology to disburse food to a dog or a cat. Petnet and Petsafe make the two most popular smart feeders on the market. 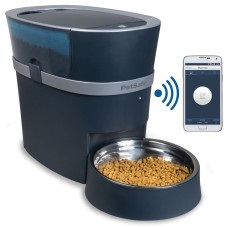 Both of these devices allow you to control your pet’s portion and feeding time from your smart phone. The WoPet, Feed & Go and Serve Smart have the above features but also come with a video camera to allow you to view your pet at mealtime. The LeBistro and Lusmo are cheaper options that don’t connect to an app on your phone. Instead, you can program these feeders directly on the device. 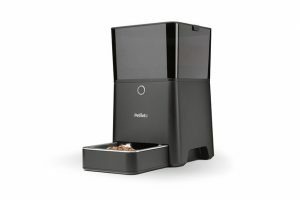 The Petnet Smartfeeder is an automatic feeder that syncs with an app on your smartphone so that you can feed your pet while you are away, schedule meals & portions, and receive alerts for meal times, food levels and SmartDelivery (pet food delivered to your home.) Can interface with Alexa and Google Voice. The Petsafe Smart Feed has built-in Wi-Fi to connect to your home’s router. You can use the app to control meals, including customizing meal times and portions. Receive alerts about eating habits. A cheaper alternative to the above two options, the Lebistro lets you program portions and meal times directly through the feeder. There is no app to control the feeder. Comes in two sizes: 18 cups and 30 cups. The WoPet is a smart feeder that contains an HD camera and 2-way audio so that you can view and talk to your pet during meal time when you are away from home. App allows you to control feeding times and portions from you smartphone. The camera can record your pet. 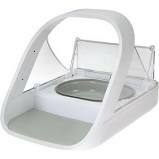 The Lusmo is a popular Japanese smart feeder that is designed for cats and small dogs. 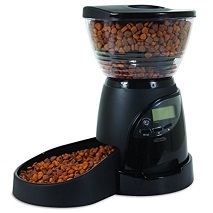 While no app is available, you can program portions and mealtimes directly into the feeder. Available in several very bright colors. Please note that the instruction manual is only available in Japanese. 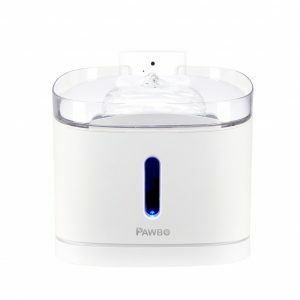 New from Wagz, is a smart feeder featurinng video and 2-way audio, and alerts when running out of food. Can interface with pets wearing Wagz’s smart collar to make sure the correct pet is receiving food.